You are Legal and Compliance professionals, we are Translation professionals. Our common point? We are all experts in finance. 1.In a few minutes, the prospectus is translated and laid out exactly in the same way as the original version. Thanks to the Artificial Intelligence technology of Machine Learning, we have developed smart automatic translation engines specialised by type of document. Our engine dedicated to Fund Prospectuses has already 3 years of track-record. 2. First Level of control: A professional financial translator proofreads the automatic translation and corrects it if necessary. We have been working for a number of years with experienced translators and finance specialists who review and amend – and in some cases even point out – (small) errors in the original document 😉 – and complete the translation. 3. Second level of control: A second professional translator conducts a complete review of the final translation. Because we know that the devil is in the details, we have put in place a ‘four-eyes’ control to ensure that the translation that is delivered to you is perfectly reliable and true to the original document. Our Motto: Ease the translation process to save you time, and because we translate faster, also help you save money. Automatic translation coupled with human post-edition – the best of both worlds – reduces the price by three compared to traditional translation agencies. 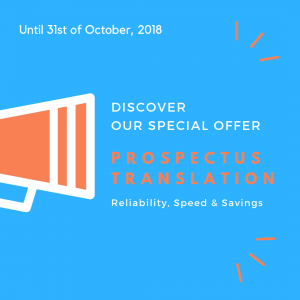 Because a test is the best way to convince you, we are offering the translation of an English prospectus to French (or vice versa) at the exceptional rate of € 500 with a 72h delivery period. This fee would be normally only applicable for a minimum order of 50 prospectuses, with each prospectus averaging about 15 pages. This offer is only valid until 31 October 2018. You want to know more, contact us! PS: Feel free to contact us as well for any other financial document types that need translation! We have designed practical and smart solutions for many document types that we wish we had access to when we were in your shoes ? PPS: Lingua Custodia is a FinTech always in motion. We have been awarded several times for our innovation capacity and solution quality – follow us on LinkedIn!